If you are an early bird, you must take a walk in the morning to watch people practising wushu all around Qingdao, at the shore, in the parks or in the walk ways. "Wushu" is the name for all Chinese martial arts and today Tai Chi (Taijiquan) and Kung Fu are the two best well known in the western hemisphere. 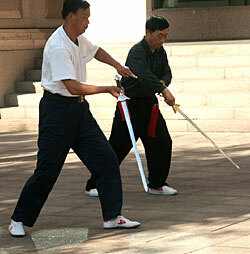 Wushu is practised all over China and is an important component of the cultural heritage of the country. Wushu means martial art, the art of fighting; literally translated “wu” stands for military and “shu” is art. Previously, wushu figured significantly in the simple matter of survival through China´s many wars and political upheaval. Today, wushu has been organized and systematized into a formal branch of study in the performance arts by the Chinese. It reigns as the most poular national sport in the country of 1.1 billion people, practiced by the young and old alike. Its emphasis has shifted from combat to performance, and it is practiced for its method of achieving heath, self-defense skills, mental discipline, recreational pursuit and competition. In the streets and parks you can meet people that performs solo, paired or in group, sometimes with traditional Chinese weapons. The wushu movements are an art that can be practised all your life. This is training for body and soul: why not ask politely if you can join a group when they are training. It´s an experience for life that can be the best gift you can bring with you home. Wushu is training for life. To describe wushu, it is best to understand the philosophy of its teaching. Every movement must exhibit sensible combat application and aestheticism. The wealth of wushu´s content, the beauty of wushu movents, the difficulty factor, and the scientific training methods are the song of the elements that set wushu apart from martial arts. 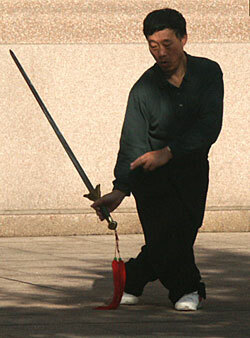 Routines are performed solo, paired or in groups, either barehanded or armed with traditional Chinese weaponry. In short, wushu is the most exciting martial art to be seen, felt, and ultimately practiced. How is wushu related to kung fu and taijiquan? "Wushu" is the correct term for all Chinese martial arts therefore kung fu and wushu were originally the same. During the last thirty years, wushu in Mainland China was modernized so that there could be a universal standard for training and competing. In essence, much emphasis has been placed on speed, difficulty, and presentation. Consequently, wushu has become an athletic and aesthetic performance and competitive sport, while "kung fu" or traditional wushu remains the traditional fighting practice. Taijiquan is a major division of wushu, utilizing the body´s internal energy or "chi" and following the simple principle of "subduing the vigorous by the soft." Although still in budding stages in many countries, wushu is an established international sport. In 1990, wushu was inducted as an official medal event in the Asian Games. Since then World Championships have taken place with 56 nations participating. Wushu is now also vying for the Olympic games.